Canadian astronaut Cmdr. Chris Hadfield is best known as the first man to cover David Bowie's "Space Oddity" while actually in space. But the video of Hadfield's performance, seen 22 million times and counting, will vanish from YouTube today due to copyright complications. Canadian astronaut and internet hero Chris Hadfield announced his retirement from the Canadian Space Agency on Monday, ending a 35-year career. 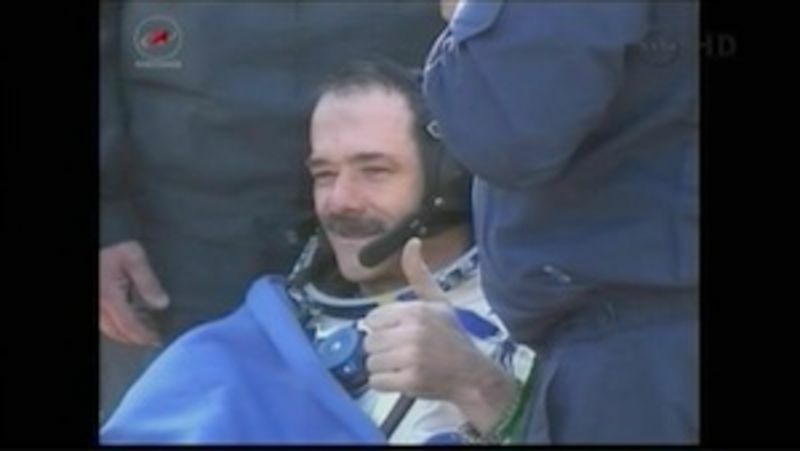 The Russian spacecraft carrying Canadian astronaut Chris Hadfield and two others has landed safely in Kazakhstan. While in orbit Hadfield became an internet sensation, most recently for his amazing cover of David Bowie's "Space Oddity." On Wednesday, the internet fell in love with this video of Canadian astronaut Chris Hadfield preparing himself a sandwich in space, or, as Smithsonian magazine puts it, "Spaaaaaaace!" It's easy to see why. The video combines two things the Internet loves: videos with a running time under two-and-a-half minutes and sandwiches.